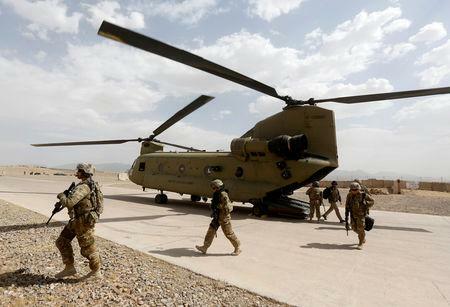 KABUL/PESHAWAR, Pakistan (Reuters) - Taliban officials said U.S. negotiators on Saturday agreed on a draft peace pact setting out the withdrawal of foreign troops from Afghanistan within 18 months, potentially ending the United States' longest war. While no joint statement was issued, Khalilzad tweeted later that the talks had made "significant progress" and would resume shortly, adding that he planned to travel to Afghanistan to meet government officials. "Nothing is agreed until everything is agreed and everything must include an intra-Afghan dialogue and comprehensive ceasefire," he wrote in the tweets. U.S. Secretary of State Mike Pompeo on Saturday wrote on Twitter that he had received "encouraging news" from Khalilzad about the talks. "The U.S. is serious about pursuing peace, preventing #Afghanistan from continuing to be a space for international terrorism & bringing forces home," Pompeo tweeted. He did not give a timetable for the potential withdrawal of U.S. forces. "The policy of the Islamic Emirate during talks was very clear -- until the issue of withdrawal of foreign forces from Afghanistan is agreed upon, progress in other issues is impossible," said Taliban spokesman Zabihullah Mujahid, using another name the group calls itself. According to the sources, the hard-line Islamic group gave assurances that Afghanistan will not be allowed to be used by al-Qaeda and Islamic State militants to attack the United States and its allies -- a key early demand of Washington. "In 18 months, if the foreign forces are withdrawn and ceasefire is implemented, then other aspects of the peace process can be put into action," a Taliban source said, quoting from a portion of the draft. The Taliban sources also confirmed provisions in the draft that have broader implications for Afghanistan's ties with its neighbors, particularly Pakistan, India and China.